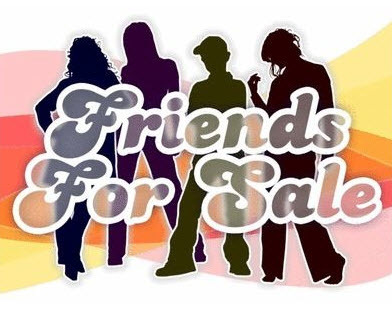 2 days ago on the 3rd of September was the end of Facebook game 'Friends For Sale' (FFS). It kinda saddens me to see such a lovely game not able to continue moving forward. I'm most probably a part of its demise as I'm a free-to-play player after all. To be honest, I looked forward to play this unique game every single day. It easily brings out the 'collector' side of me by 'buying' and 'owning' my friends, virtually. From time to time, there will be other players who purchased my friends and I've to pay more to buy them back. As the "transactions" repeat, my dear friends got alot more expensive to the point they reached billions of values. Have you ever thought of 'owning' a dozen of friends worth over billions? With the existence of Facebook, profiling has become such an irresistible habit of many. Together with FFS, it surely satisfied people who wants to feel proud of their achievements, to share and show-off their "prized possessions" to the rest of the world. 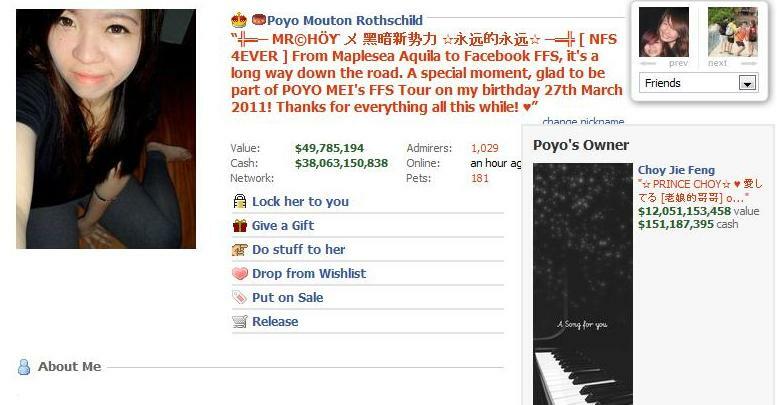 The profile of my Poyo mei, whom I met in MapleSEA! All good times do come to an end, and we will treasure the good memories it has given us.